One of those games will be the Toronto Maple Leafs vs the Detroit Red Wings at Michigan Stadium, where the University of Michigan plays football. Originally scheduled for this past New Year's, it will be the first game held in a solely collegiate venue. For years now, fans on both sides of Pennsylvania have dreamt of a similar scenario, only this one involving the Pittsburgh Penguins and the Philadelphia Flyer in Beaver Stadium on the Penn State campus, roughly halfway between the two cities. Due to issues involved with shutting down the stadium for winterization and the reluctance of those in charge to go along with this type of event, this has seemed like a pipe dream until recently, when Penn State head coach Bill O'Brien has said he'd welcome this type of event and hopes the school can get an outdoor game done. Pittsburgh-Philadelphia is one of the best rivalries in the league, and while the game would likely be one of the more exciting and anticipated matchups, if it's part of a slate of 6 (or more) games it will definitely lose some of its appeal. While the Winter Classic has been wildly popular, the NHL risks desensitizing fans with too many outdoor games, much like how college football fans routinely pass on watching bowl games such as the Beef 'O' Brady's Bowl, Meineke Car Care Bowl of Texas, Belk Bowl, and Famous Idaho Potato Bowl, among many others. The fact that you can't tell me whether or not I made up any of those bowl games with absolute certainty shows just how bad the problem has gotten, and the NHL would be wise to make sure it doesn't stray down that path. The NHL should stick with one venue per year for the Winter Classic and build up the event as big as it possibly can, starting with the Penguins and Flyers in the 2014-15 season. But while they're not expanding to other sites, that doesn't mean they shouldn't be expanding the Classic. Instead of hosting a two team, one game event, the NHL should make the Winter Classic at Beaver Stadium a four team event with the Penguins, Flyers, Rangers, and Devils all participating. The league should schedule Pittsburgh-Philadelphia and New York-New Jersey on New Year's Eve and then have the winners play and the losers play on New Year's Day. While some logistics would need to be worked out with the schedule, this would create a massive two day event and the chance to win a tournament playing against division rivals. The rivalries would create instant drama, and the tournament format would grab attention and interest. Assuming the tournament style Winter Classic turns into a success, there are several different directions the league could go for future games. 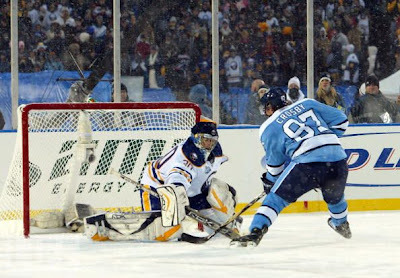 The NHL could schedule future tournaments similar to how it schedules the Winter Classic now: by picking a venue then scheduling the host team and three others that would make for good matchups. This would ensure that the matchups would be great ones and the league knows it's going to have as much excitement as possible. The league could also turn the tournament into a rotation among the four divisions, with each division having a game once every four years. To make things even more exciting, the league could make the tournament games merit based. The four teams with the most points since the division's last Winter Classic Tournament (4 years) would be invited to participate. This would ensure that the best teams made it, and usually teams that are succeeding are going to have developed some bad blood against each other and make for the the more exciting matchups and storylines. The four teams could also be chosen based off the results of the previous season. The tournament could feature the four division winners from the previous season, or it could be the four teams which advanced to the conference finals. The teams will have earned the right the be there, and they could be rewarded with the chance to win against the best in the league, with a new trophy to mark them the outdoor champions: the Classic Cup. The European soccer leagues have a similar concept in the Champions League, and while there are many differences between North American hockey and European soccer, the idea could catch on if it's handled and marketed right. After losing that deep in the playoffs, whether the Conference Finals or Stanley Cup finals, what team and its fans wouldn't like the idea of exacting a little bit of revenge? With four games, each team would need to count one game as a home game, and to make things work with an 82 game schedule the NHL would most likely need to schedule each of the 4 teams an extra dummy game or two that could be cancelled depending on the winners/losers of the first round so the teams would play each other the correct number of times with the correct number of home/road games. The Winter Classic has been enormously popular since it first began 5 years ago, but nothing that happens in the regular season could ever top the excitement of postseason play. Combining the two into one four team event would give the games a bit of extra meaning, would give the teams something more to play for than 2 points, and would generate some extra excitement about who would leave as the Classic Cup Champs.